The Tykes took a step closer towards division one safety by comfortably avoiding defeat against Hampshire. In fact, were it not for the cruel intervention of the weather, the hosts would have been well-placed to win this encounter. Now they travel to Worcester for their final fixture, needing a mere two points to confirm their top league status for next year. Surely not even stuttering Yorkshire can stuff up this gift of an opportunity. There again, any team that fails to take two points against struggling Worcestershire deserves to be relegated. 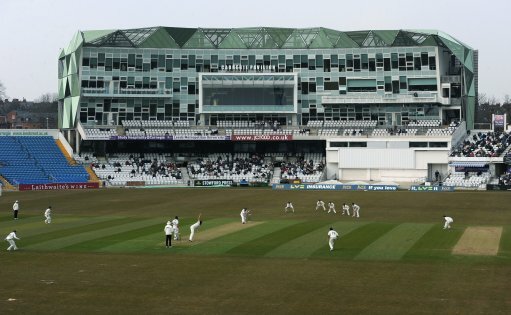 YORKSHIRE versus Hampshire; in Leeds; Tuesday the eighteenth to Friday the 21st of September. Hampshire chose to bowl. Match drawn. YORKSHIRE eight points, Hampshire eight points. Lyth - Finally our Adam gave us all a reminder of his former greatness. Lythy hit 21 boundaries and accumulated 157 runs. Where has he been all summer? Raval - This was another miserable outing for the unimpressive import. He could only muster scores of eight and nine. Fortunately, his partner was more effective. Brook - Young Harry's still not delivering enough. He was bowled for a duck first time around, and then produced a run a ball 28 in the second innings. Ballance - This unfortunately wasn't one of Gary's better performances, as he was trapped in his crease for thirty runs and then a meagre eleven second time around. Kohler-Cadmore - Tom was not able to hit the heights of recent efforts, managing only two runs and then a thirty-three. It's very difficult to sustain consistency. Tattersall - Jonathan weighed in with nineteen runs and then a patient forty-three. He's been one of our better players over the course of the last few weeks. Bresnan - Brezza had a couple of good days at the office. He blew away their middle order, with five wickets from a mere thirteen overs. Tim also hit 29 runs. Waite - Matthew didn't let anyone down. He was caught behind for twenty-two runs and then bowled five overs, taking one wicket, costing seventeen runs. Patterson - The captain could only manage nine runs, but he did torment Hampshire by conceding only twenty runs from sixteen economical overs. Brooks - The departing ferret chipped in with fourteen runs, whilst his bowling amounted to fifteen overs, costing sixty runs, and producing two wickets. Coad - Yorkshire's best player of the season finished unbeaten on fourteen runs. He also bowled very accurately, taking two wickets at a cost of only 23 runs.